The Prabhakar Post: Chinese Hard Landing Amidst Overstated Growth Nos? Chinese Hard Landing Amidst Overstated Growth Nos? China's worse than expected Trade data shows the struggle that the party faces in ensuing a soft landing for an economy that looks increasingly troubled. Post 2008 and the rise of China as a manufacturing powerhouse shipping everything from smartphones to tuna fish across the world seemed like a modern miracle of millions turning their toil and tears into golddust. Seven years later with the Chinese contemplating an american style Quantitative Easing(QE) program,its clear that the strategy of cut price goods,shoddy workmanship combined with a recessionist Eurozone and still 'zero interest' US put together are not working out for the economy. What many do not realise is the fundamental shift in policy envisaged by the top party bosses.From a fiscal stimulus driven investment led style to a consumption led model. After pumping in billions into infrastructure development,cheap credit to expand manufacturing,degrading the environment has led to an unsustainable situation viz.pollution and also a sharp decline in exports. Those in the know believe that GDP growth in China is currently around 3% and not the 7% as officially stated.Global trade is still down from pre 2008 levels,wages are rising,overcapacity,fall in housing prices by 6% compared to double digit growth a year ago,rising non performing assets-plenty of stories. 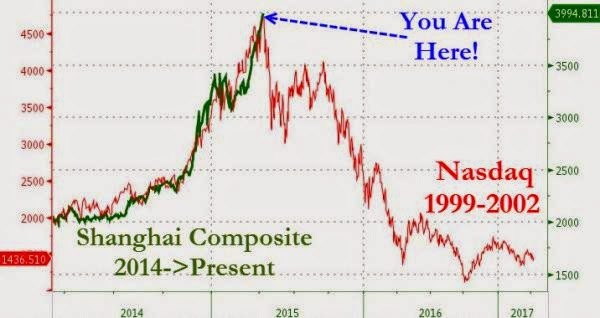 So will the next big crash come out of China? Sometime in the next couple of years China will have to depreciate the renmimbi quite sharply(20-25%)to stay competitive,A warchest comprising $3.7 trn foreign exchange reserves gives them the headroom to take appreciable measures without panic. However its open to conjecture if it will curb Chinese companies from chasing energy assets all over the world,something that has had Indian companies worried.The iron ore suppliers will face lower prices which mean a good time for Indian users. Despite all the pessimism,this is the basic reason why India should outperform in emerging markets.We have always been a consumption led economy and even a miniscule success for 'Make in India' will add an additional 1-1.5% to the GDP,which if added to the current 5% will easily make it one of the fastest growers globally.